Now Microsoft's Windows, Apple's Mac OS X and Linux (Ubuntu) users can feel and experience Stock Android for free on their PCs, computers and laptops with all new Android Remix OS powered by custom version of Android Lollipop 5.0, and will soon be upgraded to Android Marshmallow 6.0. Remix OS for PC has been developed by team 'Jide' in collaboration with a very well-known 'Android-x86' project. 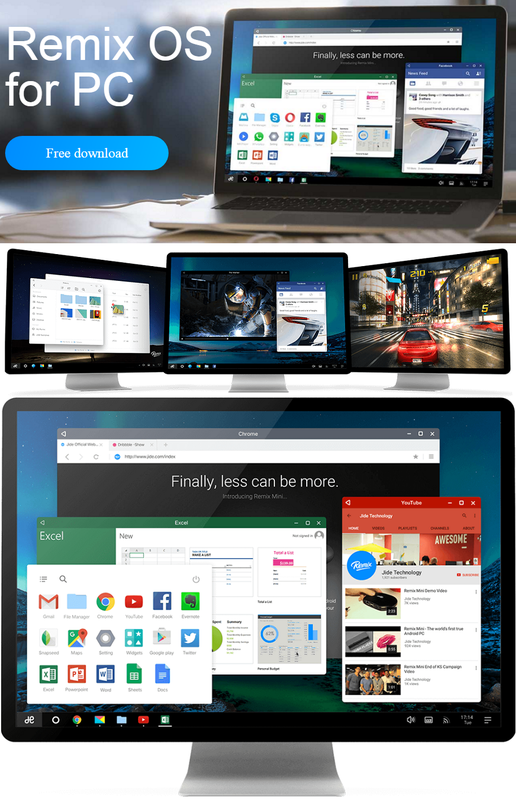 Remix OS offers variety of new features and functionaries of Stock Android on Windows, OS X and Linux (Ubuntu) operating systems with custom user interface (UI), stock android apps and stock android games as well, to make it fully compatible desktop version, just like Windows 10 or OS X El Capitan v10.11. In this post, we are writing a detailed tutorial, method and guide on How to Download and Install Remix OS on Mac OS X, Windows and Linux (Ubuntu) PC and Laptop as Dual Boot. Remix OS is an Android based portable mobile operating system works similar like Windows, OS X and Linux (Ubuntu) desktop operating systems. Remix user interface comes with user-friendly options, features and functions i.e. minimize, maximize and close buttons on every program or software screens, start menu button on desktop home screen, taskbar, windows with title bar, multitasking in multi-windows, notification center, regular software updates etc. Some pre-installed android apps and games such as; Google Play Store, Google Chrome, Microsoft Office, E-Mail App, Twitter, Pinterest, Facebook, Evernote, Keyboard, Advanced File Manager and lots more. Remix OS users can even use mouse similar to Windows, OS X and Linux (Ubuntu) to perform operations like; double-click, left-click or right-click. As currently, Android is officially available for Smartphones and Tablets devices only, being an open-source, Remix OS is very useful for developers, testers and general public users to experience latest Android platform on bigger display screens. Following Microsoft Windows operating system versions are supported for Remix OS installation. Below are the Apple's Mac OS X operating systems supported by Remix OS. A USB 3.0 flash drive with a minimum storage of 8GB that supports FAT32 format with writing speed of 20MB/s. Any-other external hard disk drive (HDD) or solid-state drive (SSD), bootable DVD or storage device. A Windows or Mac CPU with 64-bit (x64) compatibility. For any troubleshooting and help, visit official XDA Jide forum HERE. How to Install Remix OS on Windows, OS X and Linux (Ubuntu) PC and Laptop? Step 1: Download Remix OS package file via above direct links, and unzip the file on your PC / Laptop. Step 2: Now, Plug-in your USB drive with your PC / Laptop. 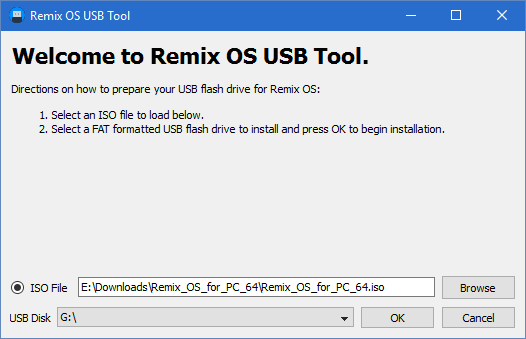 Step 3: Open Remix OS USB Tool from your package folder, and follow on-screen details to burn Android .ISO File onto USB drive (Applicable only for Windows). After making bootable USB or bootable DVD on Windows PC, OS X users can use the same USB flash drive on multiple Mac devices. Optional: Or you can also run OS X Disk Utility Application. Step 4: After that, Reboot your Windows or Mac OS X PC / Laptop. While booting Press 'F12' key (for Windows) or 'Option' key (for Mac), and choose boot option as 'USB Storage Device'. 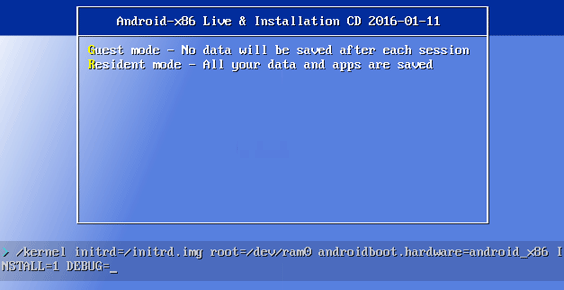 Step 5: After selecting USB boot option, now choose either 'Resident Mode' or 'Guest Mode' feature to start Remix Android OS. Info: In 'Guest Mode' (Your session data won't be save), In 'Resident Mode' (Your session data will remain intact). Congratulations!! You're done. How to Run Remix OS on Windows, OS X, Linux (Ubuntu) as Dual Boot? Step One: Follow Step 1 to Step 4 as mentioned above. Step Three: Now, Press 'Enter' key to execute the modified boot command. You will now be able to choose existing hard disk drive partition to install Remix OS. You can also alter/create current/new partitions through partition manager (as shown in image below). Congratulations!! You're done.